Here is a no-bake recipe for those who prefer to make cassava cake the traditional way. <>Cassava cake is one of the popular traditional Filipino desserts or kakanin made of grated cassava (kamoteng kahoy or balinghoy). However, it is also noted for the usually tedious process of making it because it is usually difficult peeling cassava before grating it. But as we all know, the end product always justifies the means. Through the years, different variations in the traditional recipe have been introduced. For one, there are grated cassava products that can be found in the market today. 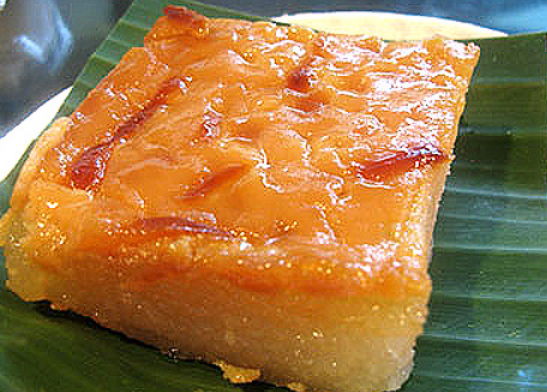 Cassava cake is commonly baked these days, which make the cooking process faster and easier to most of us. But many food enthusiasts insist that the traditional way of making cassava cake is still much better. For home-based food entrepreneurs who don’t have an oven or those who prefer the traditional way of preparing this kakanin, here is a simple recipe. Instead of baking, you would have to steam it. 1. Put grated cassava in a bowl. Set aside. 2. In another bowl, combine coconut milk, condensed milk, and macapuno preserve (set aside a little of the preserve as topping). Mix thoroughly. 3. Pour this mixture into the bowl of grated cassava. Mix briskly and continuously until creamy consistency is achieved. 4. Quickly heat banana leaf on open fire. This will be used to prevent cassava cake from sticking into the pan. (You may alternatively use aluminum foil). 6. 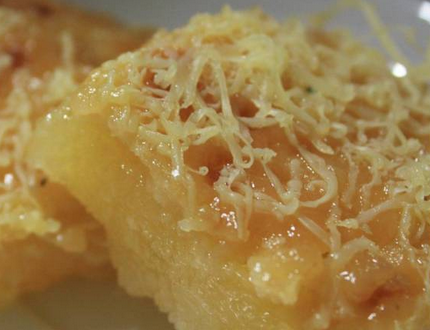 Apply margarine on top of cassava cake, then top with grated cheese and a little of macapuno preserve. 7. Set aside and let it cool down before serving or selling.